Warming up. 4km 10 strokes on / 10 strokes off. Then Steady state. And that is almost exactly what I did. I kept the stroke rates in check in the “on” intervals, because I am looking for that ideal 6km head race stroke. Still, looking at Power, I went way above 300W. On Monday’s 4x2km training, I only managed 211W average. So clearly 300W is not sustainable. Even if I take into account that on Monday I was still recovering from the week in the US. I set the SpeedCoach to show stroke rate, pace, as well as Work per Stroke and Power, and looked at the Work per Stroke numbers at steady state pace. 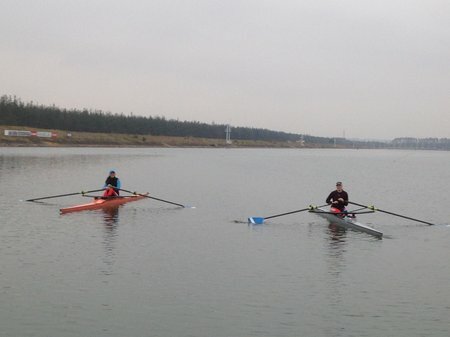 Then I did 250m intervals at higher stroke rate, but keeping the Work per Stroke around the same number. That way, I found this perfect light 30spm stroke which I think may be sustainable. I will check tomorrow. The ideal power is given by the length of the race, so it has a narrow range where you can slightly negative split over the entire length of the course. The ideal stroke length (given optimal foot-stretcher setting) is given by a minimum catch angle to work in the effective range, and the maximum catch angle that you can achieve. Arguably you should use “effective stroke length”, which gives you an additional penalty for slip and wash. 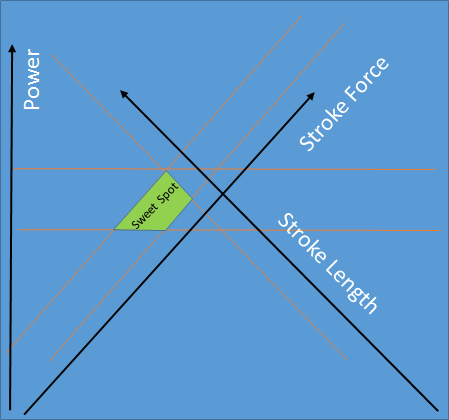 The ideal stroke (average) force has an upper bound. If you cross that, muscle fatigue will slow you down even when your fitness would allow you to continue at given power. 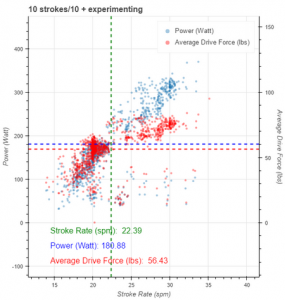 If you pick power, stroke length and average force, you basically have fixed stroke rate, stroke rhythm, and all the other parameters. Of course, for sprint races, a similar diagram can be drawn but the values will be somewhere else. It’s just a theory. And there may just as well be three other parameters to look at. 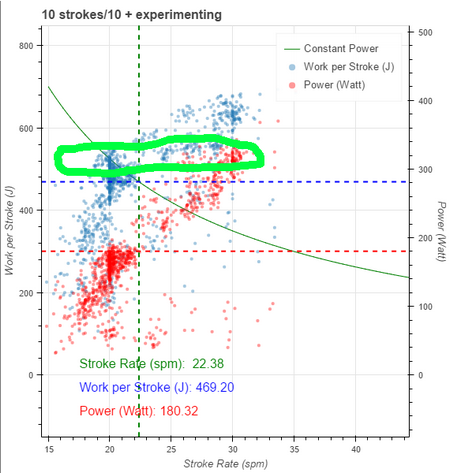 During the row, I looked at Work per Stroke (which is stroke length times average force) and Power. The nice thing about these metrics is that they are actionable. In the middle of a race, you can actually monitor these parameters on the SpeedCoach, and when they are not in the right range, you know exactly what to do. If I had to monitor “check” or some other complex parameter, I would find it difficult to act if the metric was outside the optimum range. I personally think this is extremely important. For rowing data analytics, we must focus on metrics that are easy to communicate, meaningful (as in influencing boat speed) and actionable. 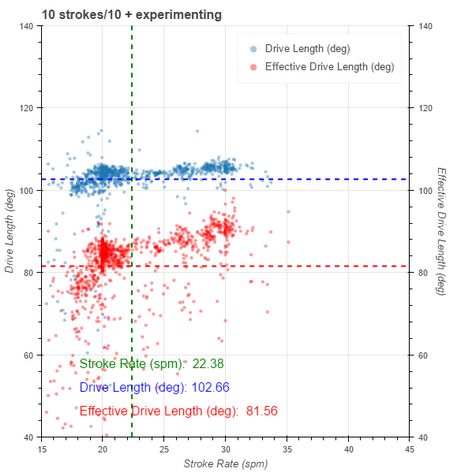 Drive length is nearly constant, but effective drive length increased with stroke rate. Not sure if that is good, but it is probably also a consequence of how “slip” and “wash” (and thus effective drive length) are defined in the NK world. The left-hand side plot shows power and average drive force. 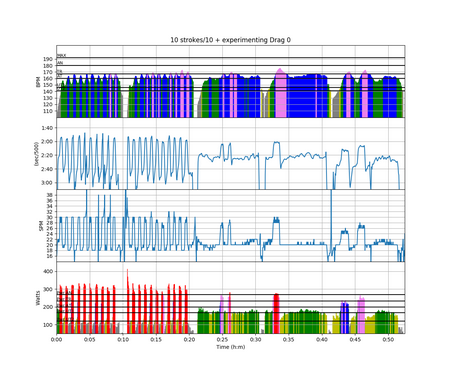 The right-hand side plot show work per stroke and stroke rate. 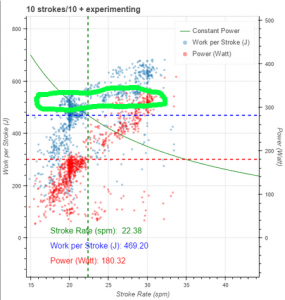 The green area shows where I tried to find the sweet spot (in terms of work per stroke). The blue dots that are higher are from the 10/10 stroke intervals, where I pulled too hard. In the afternoon I swapped the Empower Oarlock to Iva’s boat and set her up to monitor Finish Angle and Wash. I told her to keep finish angle at 40 degrees (which she did) and wash below 20 degrees, or as low as she could (which she didn’t). This shows how we have to learn to work with the oarlock as a technique tool. I forgot to tell her what the number is, and how she could work on reducing it (because it was clear in my mind). So the metric was not really actionable for her. So in the end she didn’t improve too much, even though visually it looks like her layback has improved over the week. I took a closer look at her rowing and I think there is also an element of “blades popping out of the water” in the last part of her stroke. Even with a slightly less exaggerated lean back, there just isn’t a lot of power in the last part her stroke. After the row, we showed the data to her again, and I told her she can go a lot further on every stroke if she finishes strong. It will be interesting to see if that sticks.